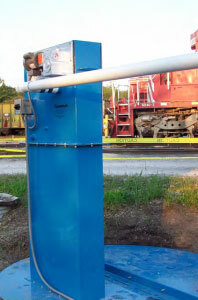 A: Our Oil Skimmers, Inc. ESS™ Enclosed Skimming System would be an ideal solution for your waste oil removal. The ESS oil skimmer system installed at the end of the separator unit will eliminate the excess oil, which will help keep the separator running smoothly and keep oil out of the waste stream. The removed oil can be re-used or recycled. The ESS mounts and encloses the Model 6V which makes it a great option for locations that require an enclosed skimmer – in outdoor applications the vapor hood protects the skimmer in inclement weather. The oil skimmer is completely enclosed, but it is also easily accessible for inspection and maintenance via an inspection window.